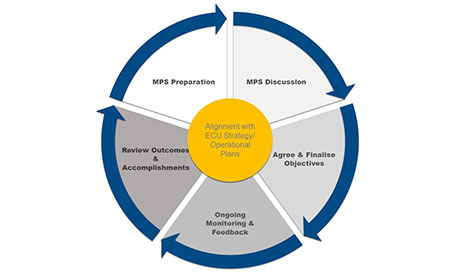 ECU's Management for Performance System, or MPS, is an annual planning and review process that enables you and your line manager to set goals for the year ahead and to review your progress to ensure these align with your area's operational plan and the University's strategic priorities. MPS involves regular dialogue between you and your line manager to discuss work progress, outcomes and professional development. All ongoing and fixed-term contract staff are required to participate in the planning and review process. There are many good reasons for you and your line manager to discuss your performance. provide you with recognition, constructive feedback, and support. provides the basis for you to manage performance improvement and unsatisfactory performance. MPS supports ECU's goals of strengthening our leadership capacity by building a strong performance culture. This part of the site provides resources to help you and your line manager set your goals for the year(s) ahead. It includes access to ECU's Role Based Development Framework. This part of the site provides resources to help you and your line manager review your achievements against the goals you set for the past year and to ensure they align with the University's strategic and operational priorities.